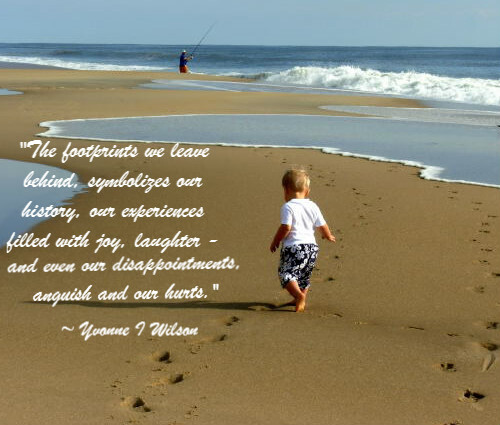 Empowerment Moments Blog: Footprints In The Sand - What Story Do They Tell? Footprints In The Sand - What Story Do They Tell? Imagine the countless times that you and I have left our footprints behind in the sand. Those prints start small from early childhood and they grow over time with the shape and size of our feet. The prints left behind symbolize our history, our experiences filled with joy and laughter and even our disappointments, anguish and hurts. They are numerous and we are still counting as we progress into our future - with occasional flashes across the clear blue sky showing that there is indeed hope for a better and brighter tomorrow. Or, shall I say your last set of footprints - you are still euphoric, or perhaps your heart is still filled with exhilaration, wishing you could be frozen in that moment, and that it not be whisked away from you! Whatever your footprints in the sand is saying, too often life seems to have overwhelmed us and everything seems to be falling apart and we are just not able to stem the tide. Our body becomes tired and we are left feeling weary to the bone. It is times like these we begin to feel as if we are all alone in the world and we do not have the energy, much less the strength to lift the weight of what has fallen upon us. It should not surprise you at this juncture that not every footprint in the sand or everything in this world is good. Not every person is happy. Not every place on this planet is safe. Evil exists all around - just take a look at the TV and listen to the news of the day. Its' devastating effect is impacting our lives and every fabric of our society. Comprehensive and awful consequences have been laid upon us as humanity and we have been smeared by passions of anger, aggression, lawlessness and violence stemming from the fumes of injustice in our land once considered peaceful and from an evil field of energy polluting our emotions. Footprints in the sand, they seem to have lost the innocence they once had of a child. Some reflect light but in the shadow they are overcome by darkness of the times we live in. Footprints in the sand - filled with discouragement and spiritual discontentment that leaves a hole in your heart that nothing or no one on this earth can fill. But whatever story your footprint in the sand is saying today, look to the hills from where all of our help comes from - our help comes from no one else but the Lord. Your footprints in the sand may have stories of heartache and tears, but be reminded that weeping endures for a night only but your joy comes in the morning. When you are at your lowest and saddest times in life, remember the last time you were there and see how God brought you through. He will do it again and again, because He change not - He is the same God today as He was yesterday and forever more will be. In your times of trial and suffering and you are unable to carry yourself, God will lift you up and carry you to a safe place of rest, peace and comfort in Him. In the midst of darkness and despair, God by His Holy Spirit will light your pathway and will make all things work out for your good. The devil meant it for evil but God for your good and for His glory. When you are tempted to throw in the towel and give in because you saw only one set of footprints in the sand, feel God's presence, feel His power, it is then He will carry you! Hi Ava, thanks for your love, support and encouragement as always. It was very easy to write this post because it related to exactly how I was feeling as I was doing so. The inference drawn with the footprints in the sand..I thought about what sort of emotions I was having, I felt burdened and heavy. But my encouragement came in the end. Today I am feeling on top of it all again. God is great and greatly to be praised! !